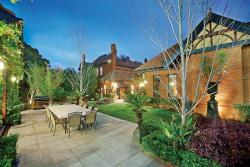 Talana is the most elaborate Queen Anne residence in Melbourne. 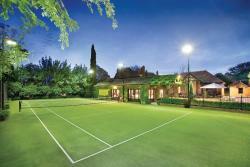 1 Harcourt St, Hawthorn East, is on the market for $18 – $19.8m. 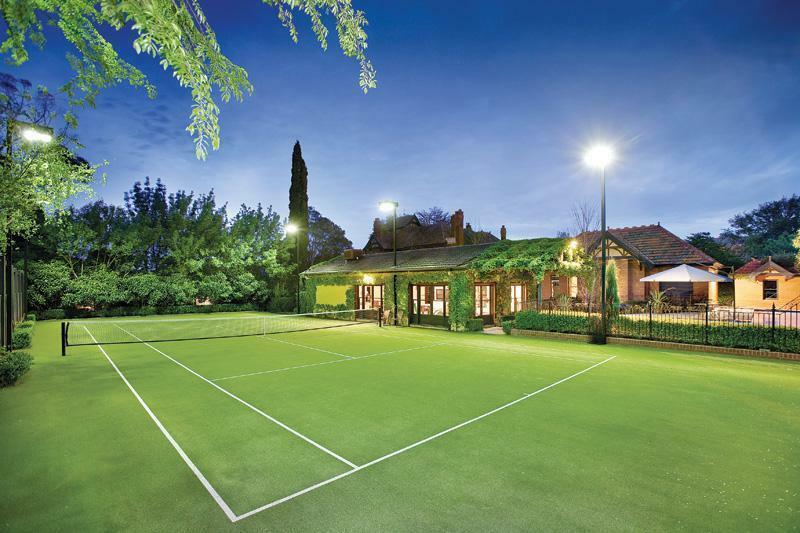 “The spectacular mansion at 1 Harcourt Street Hawthorn has hit the market with a guide price of $18-$19.8 million — almost 10 times what it sold for in the year 2000, before it had been renovated. 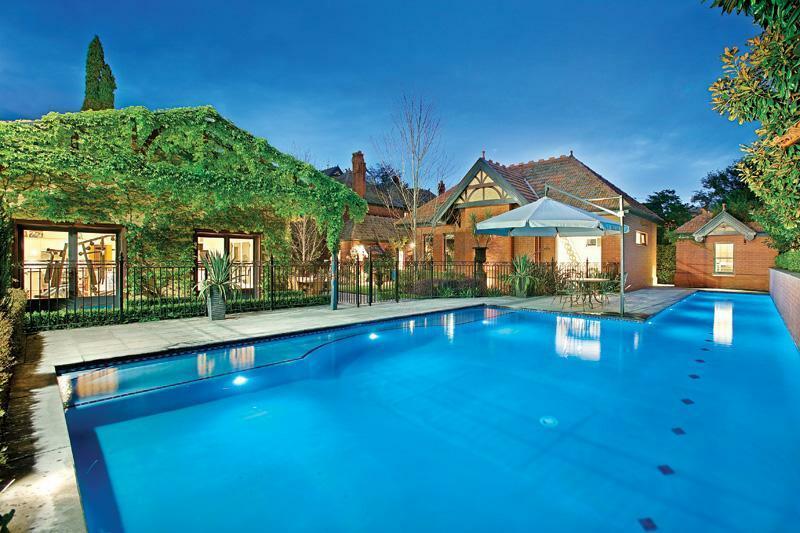 The two-storey stunner sold for $2 million in 2000, and more recently for $10.799 million in 2014 after a 1010-day stint on the market, according to CoreLogic. 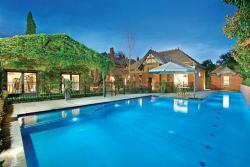 It was fully renovated between the sales. The principal facade to Harcourt Street has (overlaid on the basic form), a tower and entry porch gable feature and the return verandah is a highly individual design. Bay Window & Tower Window: The corner bay expression in the verandah is atypical and the Gothic tracery in the tower window unusual on a Queen Anne design. “The roof is clad with Marseilles tiles. Given their date, these are probably of imported French origin along with the cappings and griffon. Although the building addresses the corner site with its corner balcony, the principal facade is clearly Harcourt Street. Talana was designed by renowned Melbourne architect John Beswicke, who was responsible for the Hawthorn, Malvern, Essendon, Dandenong and Brighton town halls, and other significant properties, including ‘Rotha’, a few doors down at 29 Harcourt Street. Talana was originally designed by Beswicke for his family to live in, but the move didn’t eventuate. Rotha (1887-88, 29 Harcourt Street). Former selling agent Andrew Harlock, of Abercromby’s Real Estate in Armadale, described Beswicke’s design as “freelance Federation Queen Anne architecture”, which was unlikely to be repeated. Talana, the imposing Queen Anne-style residence at Hawthorn East, has been sold by lawyer Tony Troiani, a partner at King & Wood Mallesons. Set on Harcourt Street, the six-bedroom, three-bathroom 1900 house was designed by architect John Beswicke, the best known architect in Hawthorn during the late 1800s, having also designed the Hawthorn Town Hall. The red-brick house, with the decorative embellishments overlaid with timber, comes with a third-storey tower under the large hipped roof clad in Marseilles tiles. Having been listed with Marshall White in 2011, it was relisted through RT Edgar agent Michael Ebeling with $11 million-plus hopes in 2012. The most recent marketing agents were Abercromby’s who marketed it as offering a resort style family lifestyle with six bedrooms and three bathrooms, a tennis court with golf driving nets, enormous dual-heated lap/leisure pool, and an extra fully self-contained, Boston Ivy-clad summer house. Jock Langley of Abercromby’s real estate was expecting about $10 million. 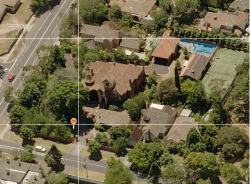 The Talana mansion sits on an acre at the beginning of Harcourt Street, just south of Barkers Road. 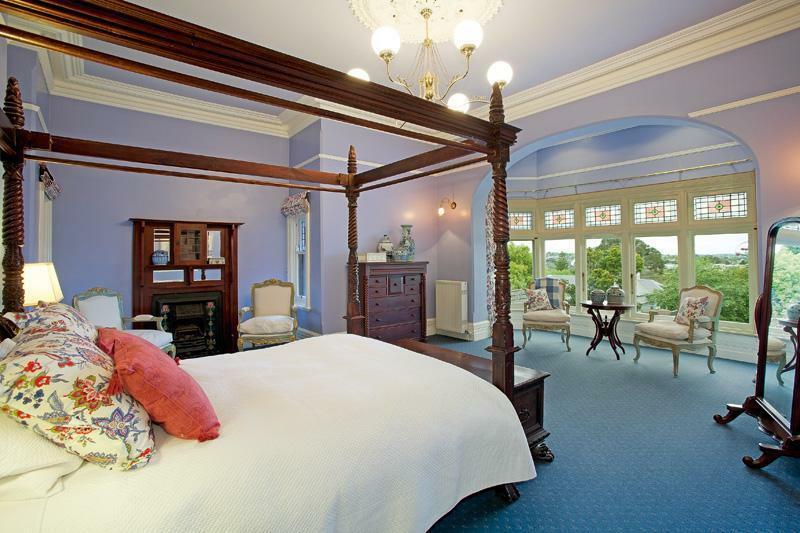 “Talana is a perfect example of a Victorian Federation mansion. Built at the beginning of the Federation style’s proliferation in 1900, Talana in Hawthorn possesses some strong Tudor influences that carried over from the late 19th century. The mansion sits on an acre at the beginning of Harcourt Street, just south of Barkers Road. At the turn of the century, Harcourt Street offered a unique pocket of grand Victorian living. Unlike Toorak, where large estates still existed unfettered and with hefty distances between them, Harcourt Street provided its residents with a unified streetscape of imposing, but consistent housing stock. Recognising the prime hill top location and the genteel reputation Hawthorn had acquired, the Harcourt Street area was amongst the first land to be redivided after the Government block land sales. The enormous block sizes and the desirable location were the key features in what was in effect a speculative mansion house development, promoted by the Beswicke family. Harcourt Street quickly became a fashionable address. Development in Auburn Road and Lyndhurst Crescent capitalized on the existing image to consolidate this region as a highly desirable Victorian period suburb for the wealthy. In contrast, the adjoining Rathmines Village area to the south, developed on the back of the mansion houses with small servicing quarters (Rathmines Grove) and more modest but respectable housing for the middle class. …[This area is of] local significance for the illustration of the flow on effect of early mansion house construction on the type of construction in the surrounding area, creating nodes of high status housing on hills, and is typical of the mixed Hawthorn character elsewhere. “Exemplifying exquisite craftsmanship and peerless detail that is rarely seen today, this historic c1900 Queen Anne Federation mansion ‘Talana’ offers a unique modern luxury across its sprawling floorplan of lovingly-preserved period splendour. Designed by renowned 19th-century architect John Beswicke, the towering Tudor-style façade is enriched with its Marseille roofing and ornate cappings, a broad tessellated-tile encircling verandah, and Gothic-arched entry. Internally, an expansive foyer introduces the elaborate chandeliers, intricate leadlights, embellished fireplaces, and gleaming polished jarrah floorboards that flood the ground floor, beneath dizzyingly high ceilings boasting a rare and superlative ornate detail. 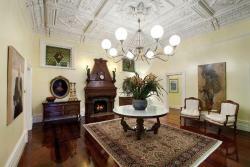 Original features of the property have been retained, including stained-glass windows, ornate ceilings and fireplaces. 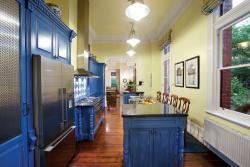 The meticulously-restored home has five bedrooms, dining rooms, sitting rooms, a home theatre and its very own “tower room”. 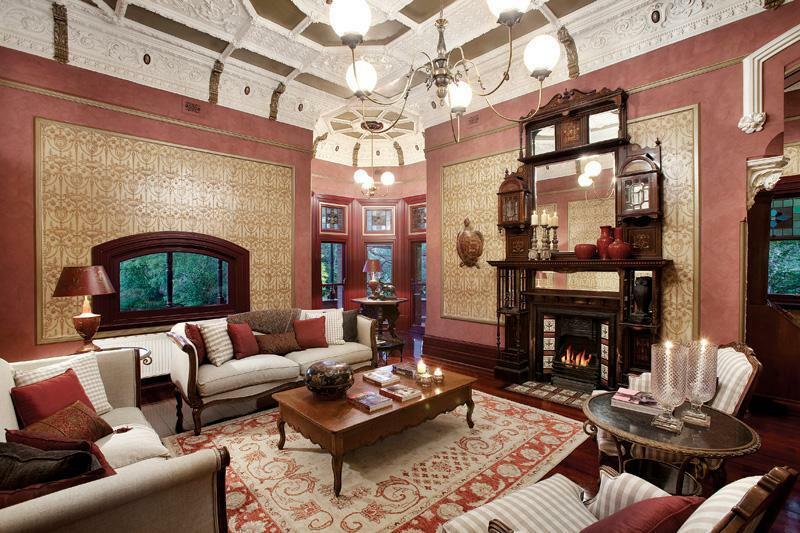 The historic Talana in Melbourne was first listed for sale with Marshall White in April 2011 with hopes of selling for $12 million plus. It didn’t. In April of 2012, the house was re-listed with RT Edgar at a slightly reduced price of $10 million (according to PriceFinder data), but by the end of August the home no longer appeared on any listing sites. It is possible that the seller, perhaps frustrated with the lack of activity on the home, did not renew their listing agreement and has taken it off the market. Talana, named after a town in the province of Ogliastra, Sardinia, Italy, was built in 1899 – 1900 for the Jones family. It was designed by architect John Beswicke, renowned for his work in Hawthorn during the late 1800s which included the Hawthorn Town Hall and two other grand homes in Harcourt Street (Rotha – his own residence, and Tudor Lodge – later renamed Hilton House). The house was built in the “Village of Rathmines” subdivision which was developed by landowner James Murphy from the mid-1850s. It originally contained 112 blocks of about one acre each. Talana is one of the original surviving mansions from the subdivision. It is located on Harcourt Street, which is known for its concentration of 19th century mansions with expansive grounds. Original house records show that it was owned by Mrs. Annie A. Jones, with James C. Jones, warehouseman, listed as the occupying tenant in 1900. Harcourt Street’s staying power since its first subdivision during the Gold Rush years of the 19th Century owes, in part, to the highly rectangular blocks of land. In 1857, we were able to dig up the below parcel map that reveals Harcourt Street’s subdivision (between what is now Barkers Road and Rathmines Road, but what was then referred to as ‘Westmoreland Street’ and the unnamed ‘Government Road’). 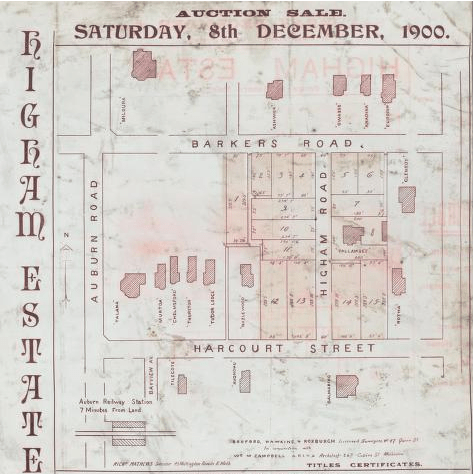 The area between Auburn Road and Kildare Street – the most prestigious pocket of 1k long road owing to its elevated views – was subdivided into twelve just-shy-of-2-acre blocks of land. The first subdivision of Harcourt Street in 1857, then referred to as ‘Village of Rathmines’. Of these original twelve, only one home retains its original parcel size (#5, although even that estate chopped off a small portion of its backyard for the inter-war subdivision of the Maurice Street cul-de-sac at the property’s rear). Even Talana, the show-stopping Federation at the entrance to the road siphoned off three properties (1A and 3 Harcourt Street, 25 Auburn Road) at various times. But that’s a digression. It is unclear to the Radical Terrace how many homes were developed during the Gold Rush era – likely very few – but by the end of the Land Boom of the 1880s, architect John Beswicke’s Italianate designs proliferated on slightly reduced blocks.